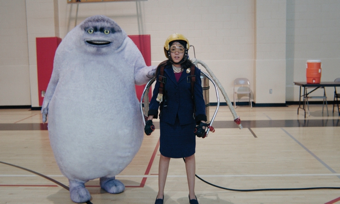 Old Navy’s “Unlimited” ad starts off normally enough but gets weird fast. It’s a bit nerve rattling. But not completely on my last nerve. The starts out with girl singing about the normal first day jitters amidst unfamiliar faces. A bit annoying but I’ve endured worse. But when she opens her locker, she’s pulled in by what I can only describe as an amorphous snowman with fur. The kicker is that the monster apparently called ‘Womp Womp’ is actually a part of her as he uses pronouns like ‘we’ and ‘us’. Either that or Womp Womp is an imaginary friend who stuck around too long. Considering the health implications of hallucinations, voices inside one’s head and constant singing, I’d say that this youngster has a lot more on her psychological plate than just school related nerves. But while this ad is undeniably creepy and sweet at the same time, I will give it credit for breaking up the monotony of back to school ads that plague TV this time of year. This whole school turning into a musical idea isn’t entirely original, though. Kmart dropped a spot earlier in the summer that featured little tykes in a flash mob style hip hop dance explosion in a lunch room. So no one can accuse Old Navy of being completely original. Even so, they’re rounding out a pretty successful summer of publicity from Jimmy Kimmel flip flops to Amy Poehler cameos. Lets just hope Womp Womp’s days are over, at least until next year. Old Navy knows their audience.